I bought this Gypsophila from the local golf club and originally planted it in the Dog-Path Garden next to some small fire engine red roses. It made such a good combination - the bridal veil white of the Gypsophila with the romance of the red roses underneath. I grow another Gypsophila in the Island Border - it gets surrounded by flowering red dahlias. Again the white and red colour combination is very striking. 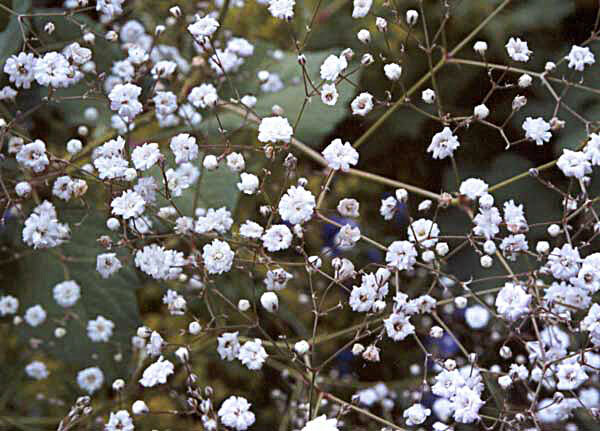 Plants with light airy textures, like Gypsophila, are really good foils for the solid green-ness in gardens. I always forget to use it, though, when I'm cutting flowers for the house. Florists would have a fit!